BUILT-IN TRIPOD: Take photos in traditional selfie stick mode or break free from the stick and whip out the tripod to take photos from up to 34 feet away! Small bluetooth remote can easily been hidden in hands from photo view for a natural looking photos. Featuring a spring loaded head on one side, and suction cup head on the other. Use this unique feature to add our mirror to take photos using the higher resolution back camera. You can also use the suction cups to attach virtually any size phone and can even take photos in portrait orientation. Use our bluetooth remote along with the stable tripod base to take quality photos not possible by hand. Get more focused and sharper images for your still life photography, nature shots, scenic photos, videos, etc. The possibilities are endless! Please don't drop the box immediately because the operating manual is printed on the box! 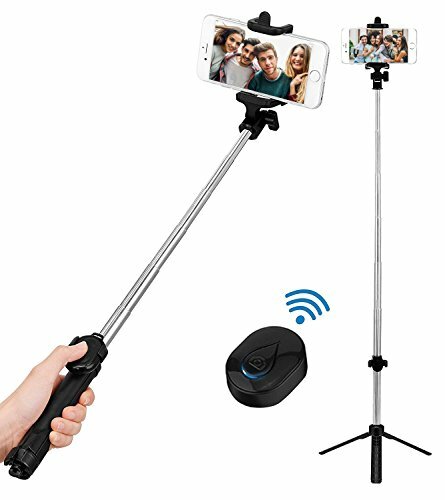 [Break Tradition]: Not like the traditional selfie stick, this device with tripod stand and bluetooth remote control can let you selfie from at most 20 metres away the phone. [Do like Traditional]: Although we give it a fantastic new function and Interaction Design, we retain the traditional. So you can use it like you being used to do. [Adjustable] 270 degree rotating head, an option to use the handheld stick or tripod stand, and ability to take photos in landscape or portrait orientation. The BOKIN Selfie Stick allows for photo adjustments of angle, distance, and orientation! [Battery replacement]: Using a fingernail or sharp hard objects at the back of the selfie stick cover gap, slightly forced to open the battery cover, remove the battery to replace it. [Why choose us]: At BOKIN, we offer a full 18-month warranty against defects in design, materials, and workmanship so you can buy with confidence. Plus 30 days 100% money back guarantee along with 24/7 customer service. If you have any questions about this product by BOKIN, contact us by completing and submitting the form below. If you are looking for a specif part number, please include it with your message.